Harrison has written three previous poetry books; his debut collection was chosen by James Merrill for the National Poetry Series. He has also received fellowships from the John Simon Guggenheim Memorial Foundation and the National Endowment for the Arts, in addition to two Pushcart Prizes, the Amy Lowell Traveling Poetry Scholarship, and Lavan Younger Poets Award from the Academy of American Poets. In several poems, Harrison scans the sky like a man who knows that the forecast for fair weather can’t be trusted. In “My Personal Tornado,” for example, he writes of “[h]eart attack, car accidents, / a lump in the breast felt / in the morning shower / the maelstrom of sudden unemployment, revelation of a spouse’s unfaithfulness, vortex of divorce—we all have one, / it’s just a matter of when it hits / and how.” There’s an uncanny resonance with Rilke’s famous poem, “Evening,” in which the darkening sky becomes a symbol of transformation (“leaving you … your life anxious and huge and ripening”). Harrison examines a wilder, more furious horizon, where the jaundiced sky “starts spinning” and “screaming peels the roof off your life and leaves you / cowering naked in its roar.” Yet no matter how chaotic the process itself, above all, this collection is about navigating change—and finally, about survival. There’s bravery in cataloging all the things one cannot know. The word know turns up again and again in these pages. Its repetition builds an agitated, restless sense of search—a litany of questions without answers. Harrison crafts an exquisite tension, integrating an emotionally combustive narrative with taut and elegant form. The poetry asserts itself as a defiantly creative act in the face of loss, and in that way, trauma finds reconciliation in language. In “The Investigation” about the aftermath of his brother’s suicide, Harrison uses the villanelle’s circular reiterations to convey grinding bewilderment and anguish. It’s as if the reader were eavesdropping on the narrator’s most private, internal obsession, with the insistent gnaw of the line “[I would never] know” and then, the refrain: “let it go.” This poem stands as a powerful example of how, in the right hands, formal structure can serve content. Even in grief, his work moves irresistibly toward inquiry, full of yearning and thus, the appetite for life. 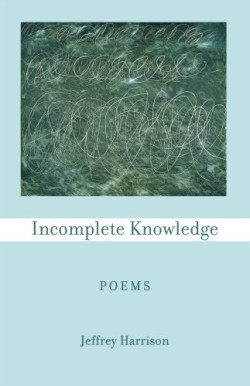 In his elegy “To Kenneth Koch,” the poet addresses his “first and best teacher” with the lines: “I have your poems that never stop asking / ‘So what is the ecstasy / we are allowed to have in this one life?’” The tenacious scrutiny and wonder of questions in this book are Harrison’s most potent homage.